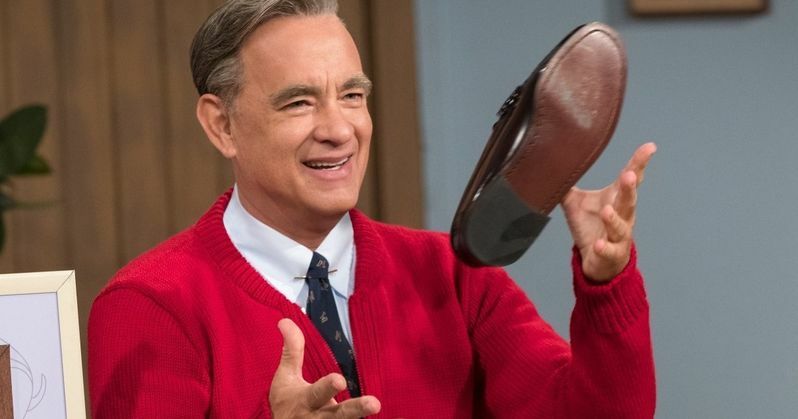 It is, indeed, A Beautiful Day in the Neighborhood as Sony has just released a brand new image of Tom Hanks as Mister Rogers from the upcoming biopic. There has been something of a renewed interest for the late children's show icon and general beacon of all that can be good and pure in this universe. That is set to culminate later this year when this movie hits theaters and, based on this latest image, we're in for one heck of a transformative performance from Hanks. The image has been released in honor of what would have been Fred Rogers' 91st birthday. Sadly, Rogers passed away in 2003 at the age of 74 following a battle with stomach cancer. This image sees Tom Hanks donning the classic Mister Rogers look, which we've seen in previous images. What's different here is the iconic moment that he's recreating. Anyone that ever watched the show remembers watching the icon put his shoes on, singing his classic theme song, playfully tossing one through the air. Hanks totally captures that moment beautifully in this new image. Are we, as people, prepared for what this movie is going to do? Tom Hanks is arguably the most beloved actor on the face of the planet, if not just one of the most beloved individuals from any walk of life. The idea of having him play someone as beloved as Fred Rogers, seemingly with such precise accuracy, is going to be a lot to handle. Movie theaters would do well to offer a complimentary box of tissues at each screening because we are all definitely going to cry. There are few sure bets in this life, but that seems like one we can take to the bank. And we haven't even seen any actual footage yet. A Beautiful Day in the Neighborhood chronicles the later years of Fred Rogers life and won't be a traditional biopic. Instead, it will focus on a relationship he developed with cynical journalist Tom Junod, who will be played by Matthew Rhys (The Americans) and is based on an article he wrote about Rogers. The timing couldn't be better, with the documentary Won't You Be My Neighbor? arriving last year to widespread critical acclaim, box office success and again, lots of tears. It also is quite possibly the biggest snub of this year's Oscars, considering it wasn't even nominated for Best Documentary Feature. Marielle Heller, coming fresh off of her Oscar-nominated biopic Can You Ever Forgive Me?, is in the director's chair, working from a screenplay by Micah Fitzerman-Blue (Transparent) and Noah Harpster (Maleficent 2). With any luck, we'll be seeing a trailer for this one sooner rather than later. A Beautiful Day in the Neighborhood is set to hit theaters on November 22. Be sure to check out the new image from Sony Pictures below.